This display pays homage to old-fashioned analog recordkeeping and the books that keep it organized. 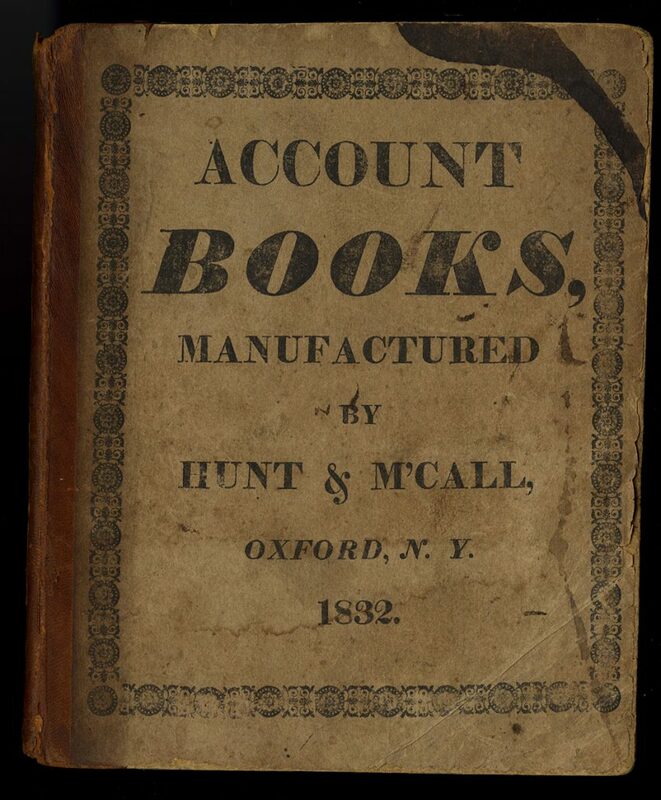 Account book manufactured by Hunt & M’Call, Oxford, N.Y. 1832. Michael Zinman Binding Collection. This book was used by James G. Brown of Windsor, New York, from March 10, 1832, through 1859. Book to track prices and sales of stocks and bonds. Gilpin & Company Papers, 1852. In a clever modification, the user of this book added extra pages. Each loop of thin cord holds a folded sheet of paper in place. Book to track prices and sales of stocks and bonds. Gilpin & Company Papers, 1864. Loan book of the Library Company of Philadelphia, 1794-1812. The Library Company of Philadelphia was originally a lending library. 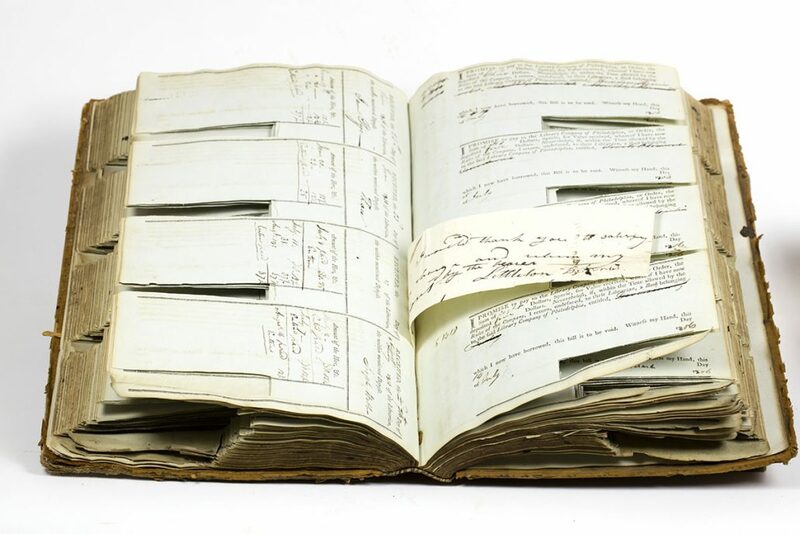 This loan book tracked borrowed books using printed forms filled in by hand. Upon the return of the book, the librarian cut away the borrower’s signature to cancel the note. Ship’s logs contain detailed information about ocean weather patterns. They were a critical reference for seamen. Today they are a treasure trove of historical data that scientists are using to refine climate model projections. Ships’ log for Hantonia II (constructed in 1811). Michael Zinman Binding Collection. 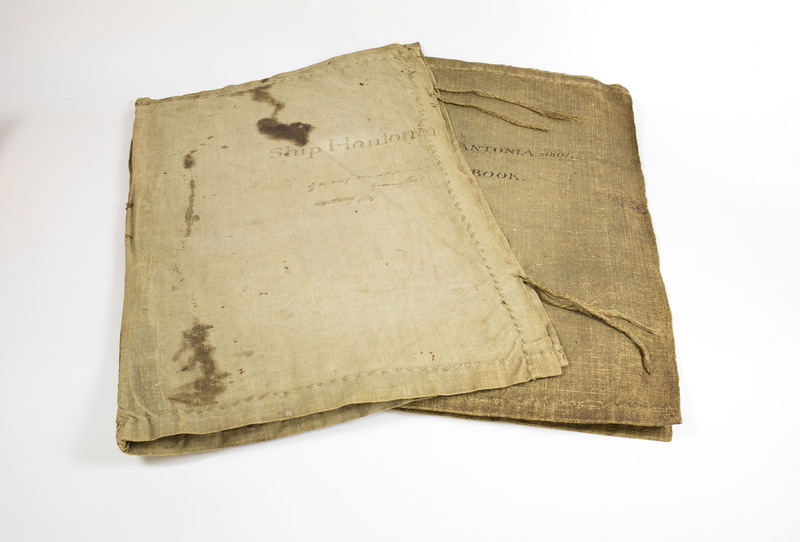 Bound in flexible sailcloth, the book could be rolled up and safely tucked away inside the captain’s overcoat in case of wet weather. – Fresh gales and dark squally weather. – Fresh breezes and tumbling seas. – Strong gale and heavy seas. – Strong breezes and flying clouds. 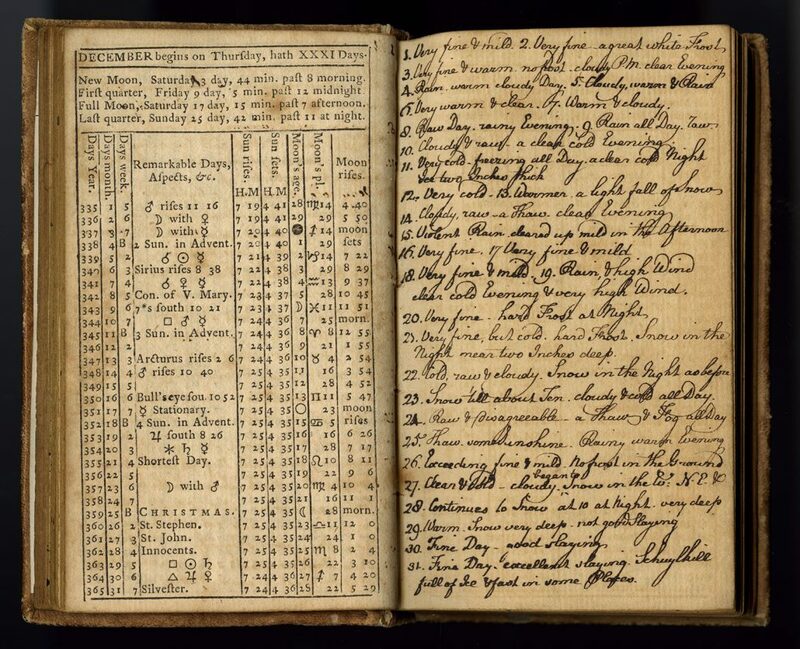 Aitken’s General American Register, and Calendar, for the Year 1774 (Philadelphia, 1773). Continues to snow at 10 at night. Very deep. Warm, snow very deep. Not good slaying. Fine day, excellent slaying Schuylkill full of ice & fast in some places. 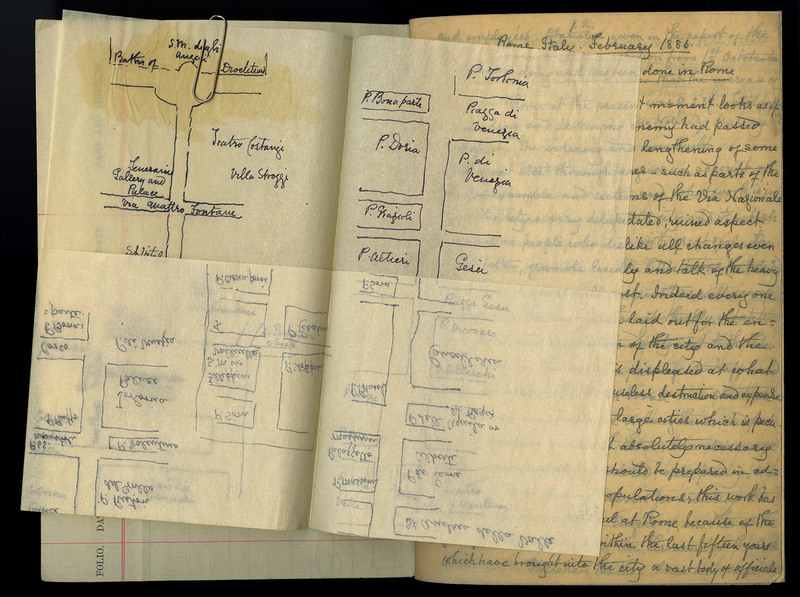 In the19th-century workplace, new “copying” technologies greatly simplified record keeping and retrieval. One long-lived method employed a cast iron “copy press” along with special patented inks and papers. Wedgwood’s Improved Copy Book (London, ca. 1870); Anne Hampton Brewster Papers. These copy books contain copies of Anne Hampton Brewster’s contributions to the Boston Daily Advertiser, July 12, 1870-May 3, 1871, and the New York Evening Post, December 22, 1886-February 16, 1887. 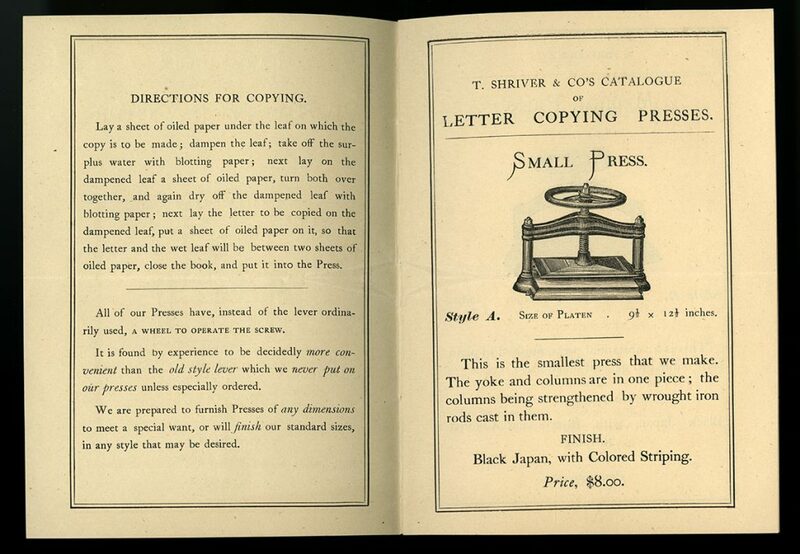 Shriver & Co’s Patent Improved Letter Copying Presses (New York, 1868). David Doret Business Ephemera Collection. 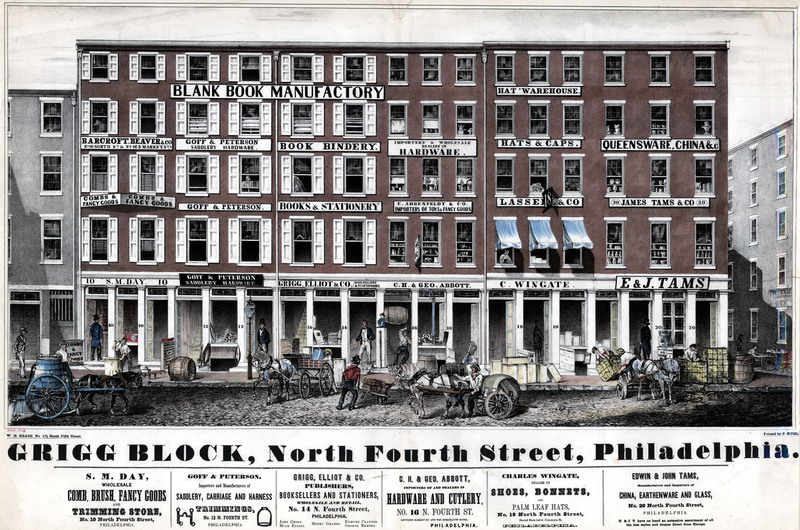 Rease, W. H. Grigg Block, North Fourth Street, Philadelphia. [Philadelphia, 1848]. Hand-colored lithograph. In this busy street scene from 1848, books are a prominent feature of the cultural and visual landscape.